Blue Flamingo Info: Did you know? Did you know? 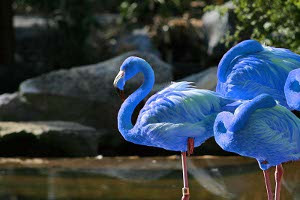 The blue flamingo gets his blue feathers due to his diet of bluefish and shrimp. Did you know? One out of ten blue flamingos survived the cougar attacks. Did you know? The blue flamingo can change his eye colour depending on his mood: yellow is happy, red is angry, and white is scared. Did you know? The South American Blue Flamingos can run up to 20 miles per hour! Did you know? The blue flamingo is very shy, but once you get to know him/her, the bird will be friendly, and sometimes our blue flamingo, Goofy, will play hide and go seek! Did you know? A blue flamingo bite is very painful, so watch out if you ever happen to meet a blue bird!